To Hell With Hell, if it could maybe tone it down a little, would be a cool, good, and interesting twin-stick shooting roguesortamaybekindalike with a main character I’m still not sure about. As it is, it’s definitely got two of those, and is working on a third. The masks in this game are, even at their worst, quite interesting. Fine example: The ninja mask has a stunning harpoon that pulls enemies toward you. GET OVER HERE!!! The game’s plot, such as it is, involves Natasia, a scantily clad woman who, as it turns out, is one of the many children of a Duke of Hell, part of their backup plan if, for example, they were deposed by other minions of hell and held captive. At the present time, despite the comic book presentation, this really is “Such as it is”, a somewhat flimsy justification for a scantily clad woman to shoot demons. I’d say more, but the game’s really not giving me a lot to work with here beyond that. So… Swiftly moving on! There is, thankfully, more meat aesthetically and gameplay wise, because this is… A game that touts its difficulty. Wait, don’t run away, it mainly does this with enemies being bullet spongy, the player not being bullet spongy, limited ammunition (encouraging you to switch weapons, or use melee… The latter’s not a great option, unfortunately), and limited saves on a run (6 saves on the basic difficulty, which comes to one save every 2 levels.) That this is the easiest difficulty perhaps sets the tone (slightly offputting, at the present time), and if it were just this? I would be much less kind, considering some of the enemies, such as the goat-headed explosion summoner, the large toad-thing that fires fans of bullets, and the fact that even the lowest tier of enemies takes between 3 to 5 shots to kill. 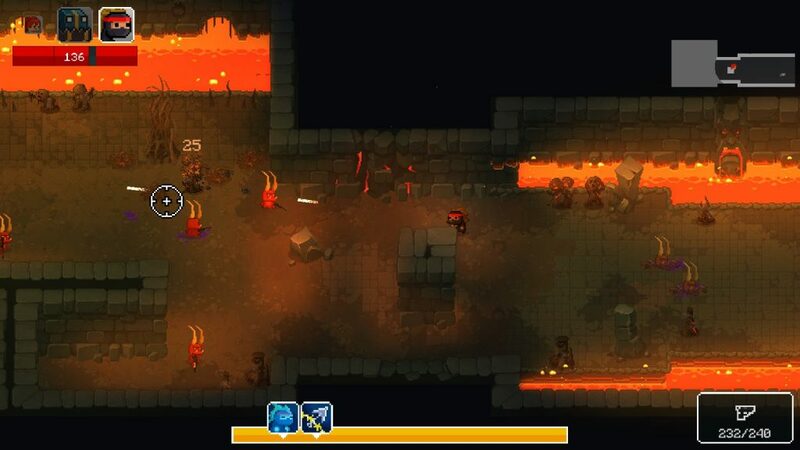 Oh, and melee enemies and minibosses. Let’s not forget those. 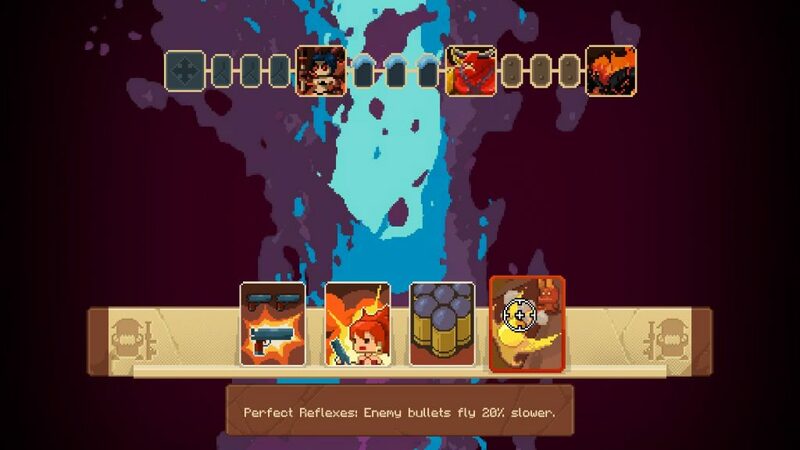 As I said, thankfully, there’s more to it than this, because not only are there random skill ups on successfully completing a level (such as slower enemy bullets, more damage, a chance of health on killing an enemy, so on), the health can be boosted, and further abilities gained… With masks. Seemingly inspired by games like Wonderboy, Kid Chameleon, or Magician Lord, not only are there guns, health, and ammo pickups, there are masks, of which you can normally carry two, one or two appears per level, and each adds both health and special abilities, of varying use. 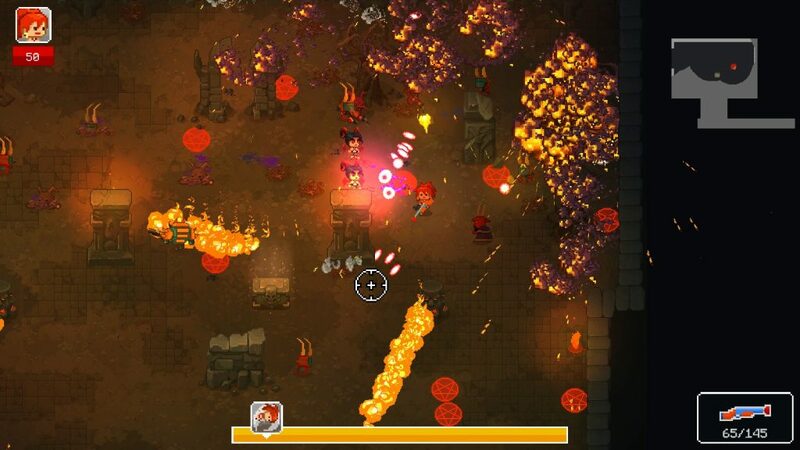 Lose health, lose the masks, but while you’re carrying them, things like eating guns for ammo (eh), shotgun blasts (fair), shields (the SWAT mask), and fireballs (the cacodemon mask, a very nice area of effect) are yours to command, and you can switch between them. Finally, add in that you automatically reload from your save when you die, allowing you to bully on through in some (but not all) cases, and… Well, it goes from highly frustrating to moderately so. Maybe it’s because a pair of goat-heads can really ruin your day from a surprising distance away that you have to cover while probably being shot at, and they don’t have to worry about line of sight. Maybe it’s because the starter pistol is, far and away, the worst option for dealing with enemies. Maybe it’s because, despite the fact melee deflects bullets, it’s a little slow. It’s nothing obvious in the design that’s putting me off, mechanically… But it is, at the moment, putting me off. As noted, aesthetically, it’s fine. Enemies are clearly differentiated from the background, the levels have been brightened up from when I last looked at it, so it’s less muddy, and its pixel stylings definitely say “Hell” while working within the constraints of a twin-stick shooter. Musically, it’s that most devilish of music, hard guitars, and I am perfectly okay with this. But, right now, although it’s hard to define, To Hell With Hell essentially needs to work on its balance. Maybe that means having slightly beefier guns. Maybe that means having less tanky enemies for what is currently the lowest difficulty setting. It probably doesn’t mean making the masks more powerful, because that, funnily enough, is one of the parts that feels right. But, overall, To Hell With Hell isn’t quite my cup of tea, being a little too devilish for my personal taste. 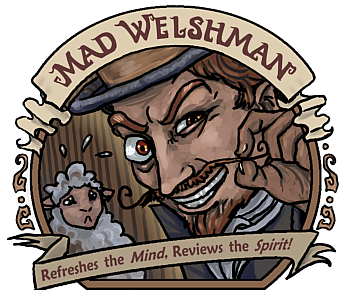 The Mad Welshman is well acquainted with Hell, one of the many underworlds and places of punishment he visits for entertainment purposes on a semi-regular basis.